Effective NOW – Okanogan County now in the Apple Maggot Quarantine Area. Homegrown fruit and green waste cannot be transported outside of the apple maggot quarantine area. These materials must remain in the quarantine area to prevent the spread of apple maggot. ** Unsure if you are in the affected area? Check your address HERE. Haul your organic waste to the Twisp Transfer Station, separated from other waste. Check the website HERE for more information. Compost (learn how from the Okanogan County Master Gardeners). 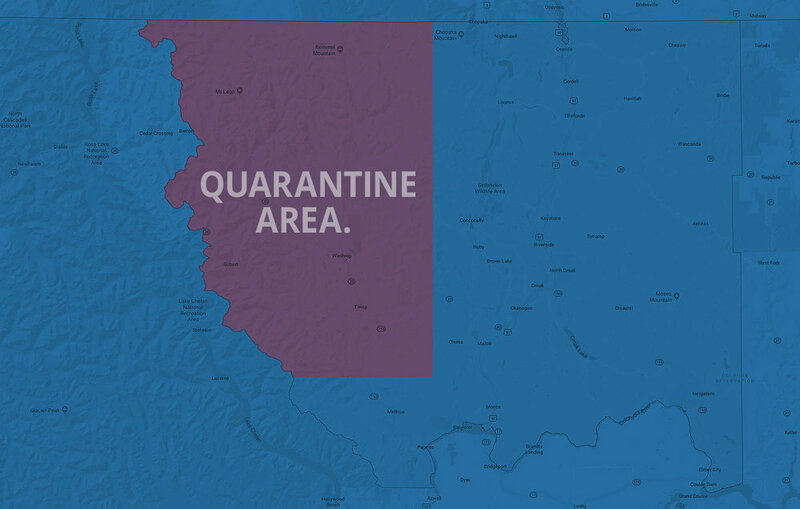 Visit the WSDA website for more information about the quarantine, how to stop the spread of apple maggot, and to check your address on the interactive map. WSDA’s apple maggot homepage can be found HERE. The Okanogan County resident website can be found HERE. We'll be in touch soon, thank you! Locally owned and operated, WasteWise is committed to the responsible management of the Valley's waste stream. We offer convenient and affordable garbage and recycling options for everyone in the Methow Valley. Life is busy, let WasteWise do the dirty work.